Hello! Happy Wednesday! I made a 6" x 4" card for my Project Life album. Next week is our (Dan + me) 13th anniversary, so I thought I'd include this in one of the pockets for week 6. 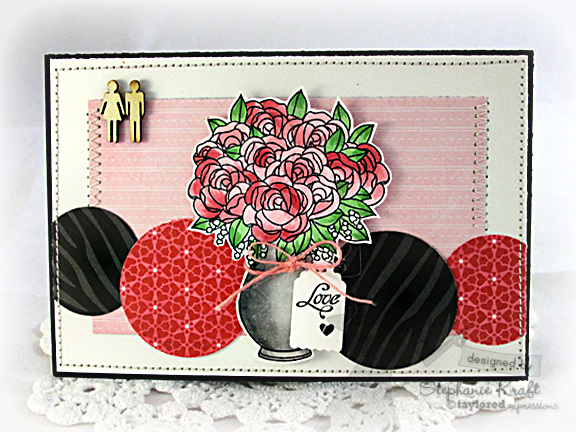 I stamped, colored and fussy cut the flowers from Rose Bouquet. I also stamped the sentiment onto one of the Designer Mini Tags, then tied it around the vase with some pink twine. All patterned paper is from the Echo Park Love Story collection. 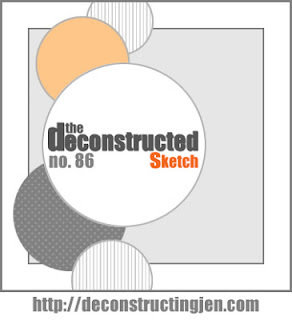 I used Jen's Deconstructed Sketch #86 for my layout. Accessories: Taylored Dies: Designer Mini Tags (Taylored Expressions), Circle punches (EK Success), Markers (Copic), Wood veneer people (Studio Calico), Pink twine (May Arts), Foam tape, Thread, Sewing machine. Such a pretty card Stephanie! Love the beautiful vase of roses! Happy Anniversary! So Cute! I love the tag on the vase.